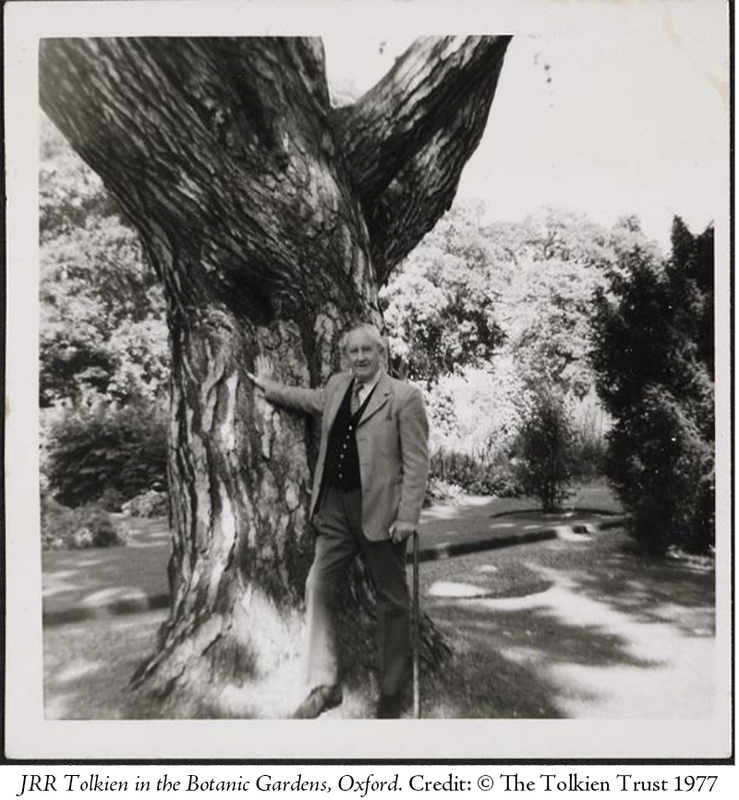 “Tolkien: Maker of Middle Earth” opens at the Morgan Library and Museum in New York City January 25, 2019. 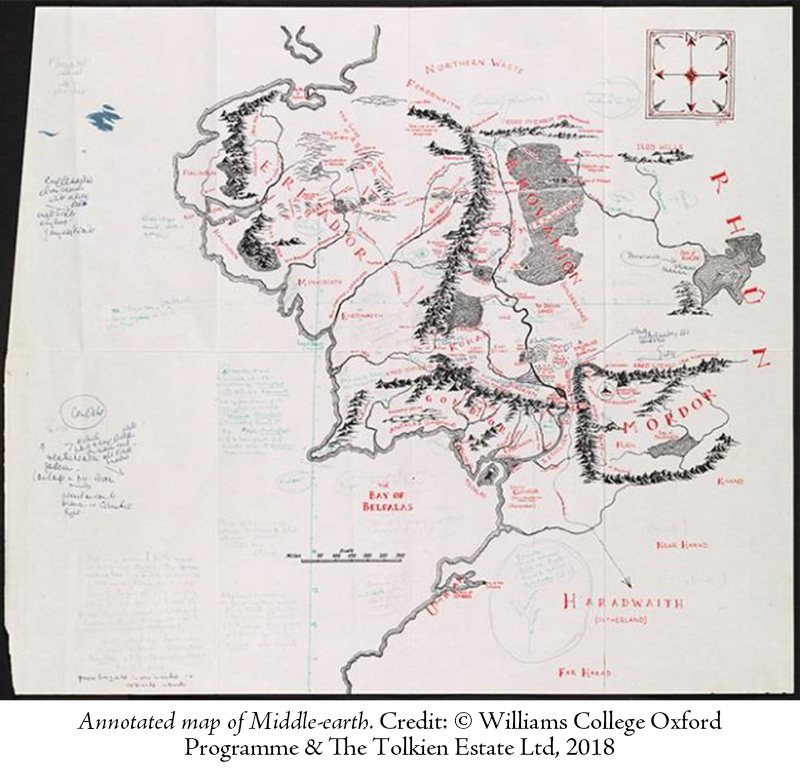 It appeared at the Bodleian Library at Oxford University June 1-October 28, 2018.
isiting Oxford in August is perhaps not the best way to get a glimpse of the world in which J.R.R Tolkien lived and worked. Great tour buses crowd the central streets, disgorging hordes of tourists who, I learned, dismay the Oxford city fathers by spending an average of only about two hours perusing gift shops and seeing the sights before riding on to the next picturesque English town. I myself hoped to go in a bit deeper. As one leaves Oxford’s High Street and passes through the entrance of Magdalen College, the sounds of hurried pedestrians and heavy rushing traffic fade. One enters a quiet world of green quadrangles, grey stone walls, and medieval chapels. Moving through hushed, cloistered walkways, rounding one corner, and then another, there is a small stone bridge under foot. Looking down, the dark water of a small branch of the River Cherwell softly laps against mossy walls. Turning north, one is on the tree-shaded path of Addison’s Walk. Somewhere in the building to the left are the rooms C.S. Lewis occupied while a Fellow in English literature and from which he looked out over the open fields of The Water Meadow. In it, dappled-coated fallow deer lie in the shade of a great oak, seeking shelter from the mid-day sun. On this same path, late one night, Tolkien had the famous conversation with Lewis that set the latter on his journey from being a convinced atheist to becoming one of the 20th century’s most influential Christian apologists. It is an enclosed garden, a world of its own with a heady mixture of sights, scents, echoes, and remnants: of idealized English countryside, of medieval Christian certainty, and of ancient learning. One wants to stay forever. Oxford University has educated two of Britain’s kings and twenty-five of her prime ministers, and yet the most widely-known person associated with it (except for the imaginary wizard Harry Potter—whose paraphernalia fills tourist shops because parts of the movies were filmed here) may be J.R.R. Tolkien. Oxford was Tolkien’s home from the time he began studies at Exeter College in 1911 until his death in 1973, apart from some years in retirement when he and his wife Edith moved to the seaside town of Bournemouth to escape the incessant attentions of enthusiastic fans of The Lord of the Rings and The Hobbit. Just a few steps away and around the bend from shops hawking magic wands and Quidditch brooms is the Bodleian Library—the primary repository of Tolkien’s literary estate and personal effects. The Library is currently hosting “Tolkien: Maker of Middle-Earth,” its first major exhibition devoted to the author’s life and work in more than twenty-five years. The exhibit contains literary treasures and curiosities, such as a draft page of Tolkien’s never completed or published translation of Beowulf, the foundational Anglo-Saxon epic poem on which Tolkien was an authority. There are rejection letters from publishers, mail from famous fans, and jotted notes for works in progress. The emphasis of this exhibition, however, is not so much on the books themselves as on the surrounding world that Tolkien created, both linguistic and visual. 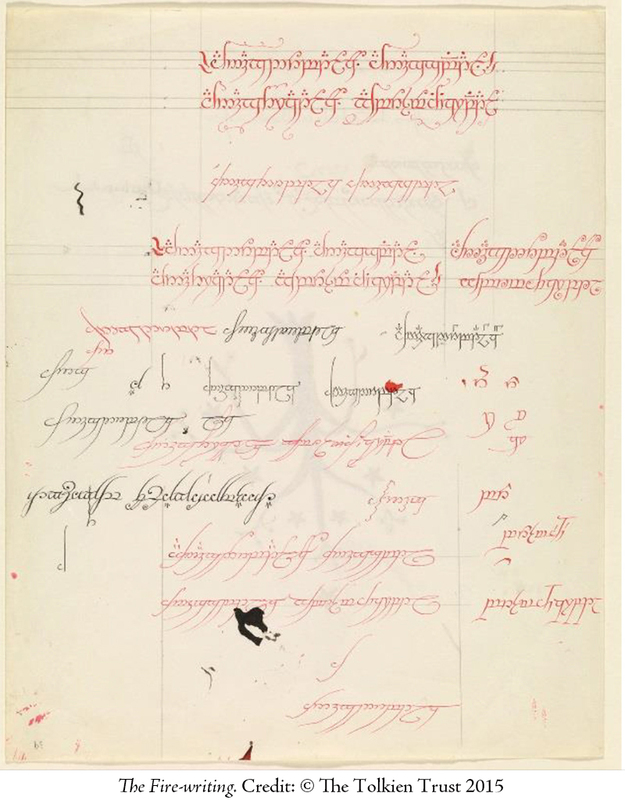 While most readers of The Lord of the Rings might assume that Tolkien created bits of Elvish language to give color to his story, the opposite was actually the case. Tolkien spent most of his career with the broad title of Professor of English Language and Literature, but his real passion was languages. By 1915, four decades before the publication of The Lord of the Rings, he was already creating imaginary Elvish tongues as an end in itself, with no intention of writing books. “The invention of languages,” he wrote, “is the foundation. The ‘stories’ were made rather to provide a world for the languages than the reverse.” The Bodleian exhibition contains a number of treasures from this wellspring of Tolkien’s creativity, such as original examples of his writings in Elvish script (he was a skilled calligrapher). For those who share Tolkien’s love of the history of languages, there is also a detailed handwritten “Tree of Tongues”—a diagram of the dozens of Elvish languages, dead and living, as Tolkien imagined them descending from an ur-language spoken at the dawn of Elven time. Tolkien was also a talented artist, and the exhibition features a selection of his drawings and paintings. The original watercolors he painted to illustrate The Hobbit take up most of a display case, and there are exquisite colored pencil drawings of Elvish heraldry that he created for the royalty and nobility of his world. These latter hint at an aspect of Tolkien’s art that is only alluded to in the exhibition but that is demonstrated in glorious detail in the fine catalog/companion volume, Tolkien: Maker of Middle-Earth, edited by curator Catherine McIlwaine. It contains reproductions of items that weren’t displayed in the exhibition as well as essays about Tolkien’s life and work that will become new standards, rich in detail while elegant in economy of prose. As with language, one might suppose Tolkien first wrote the stories and only later created illustrations depicting them. The evidence is rather that the visual creations arose alongside his literary creations. 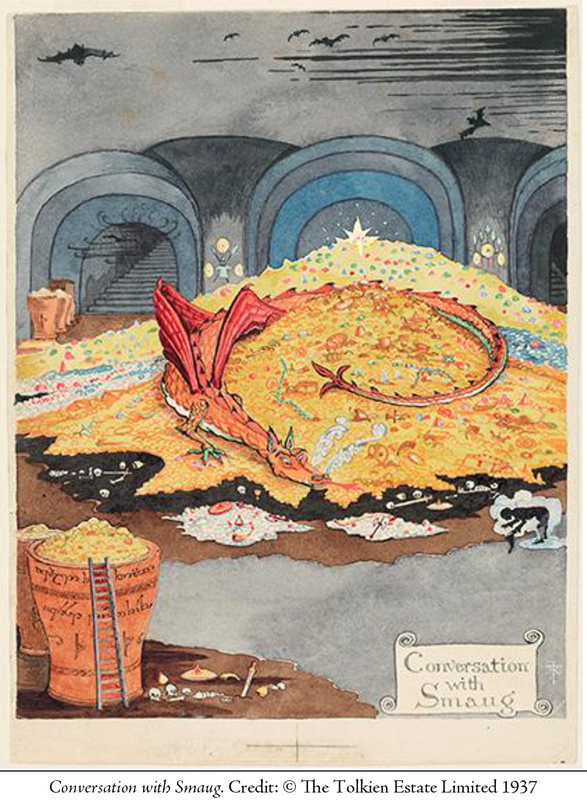 In some cases, his paintings and drawings of Middle-Earth seem to have preceded the stories. Tolkien only rarely illustrated characters from his novels but instead drew Middle-Earth itself: its mountains, cliffs, waterfalls, valleys, forests, fields, towers, and fortress walls. While few of his drawings were published, it seems that he had a compelling need to create a visual world for his stories to come to life in, just as he created the stories as a place for his imaginary languages to live. Tolkien, like most Englishman of a certain class and era, had been taught to draw at school, and the sketch-pad remained his constant companion. He wrote his books during what he called “stolen moments” scattered throughout a rich and demanding life, but his painting and drawing required solitude and rest and was usually done while on holiday. With some tentativeness, knowing he wasn’t a professional illustrator, he offered his watercolors for The Hobbit to the publisher as examples of how he envisioned Middle-Earth. Once they were in hand, however, it was clear that nothing else would do, and Tolkien’s artwork was immediately incorporated. He was even asked to produce more paintings, including the now classic cover art. The Lord of the Rings was a different matter, and Tolkien informed the publisher that he was not up to the task of providing illustrations. He felt he had already pushed his ability to its limits in his Hobbit illustrations, and knew finishing a work of such length would be daunting enough for a part-time author. As it was, seventeen years passed between the publication of The Hobbit and the first part of The Lord of the Rings appearing in print. The publisher felt the latter was too long to be published in a single volume and divided it into three books, so it was just as well that Tolkien didn’t have his heart set on illustrating it. The extra expense of illustrations was never really considered, since the publisher was already concerned about how much money the project would lose. This was, incidentally, a stroke of luck for Tolkien and his estate, since the worried publisher offered a deal in which the author was paid a considerably smaller advance in exchange for half of the profits of the book—profits no one imagined would materialize. As impressive as Tolkien’s art may be, the most stunning aspect of the Oxford exhibition is the collection of maps. The centerpiece of the gallery is a three-dimensional map of Middle Earth that one can walk around and examine from various angles as though in a military war-room, an appropriate analogy given that The Lord of the Rings centers on those caught up in a great struggle for the survival of Middle-Earth. Various journeys taken by the Hobbits Frodo, Sam, Merry, and Pippin light up, bringing to life forgotten and poorly understood parts of the stories. The original of the famous map of Middle Earth used in most editions of The Lord of the Rings holds a place of honor near the exit point of the exhibition. 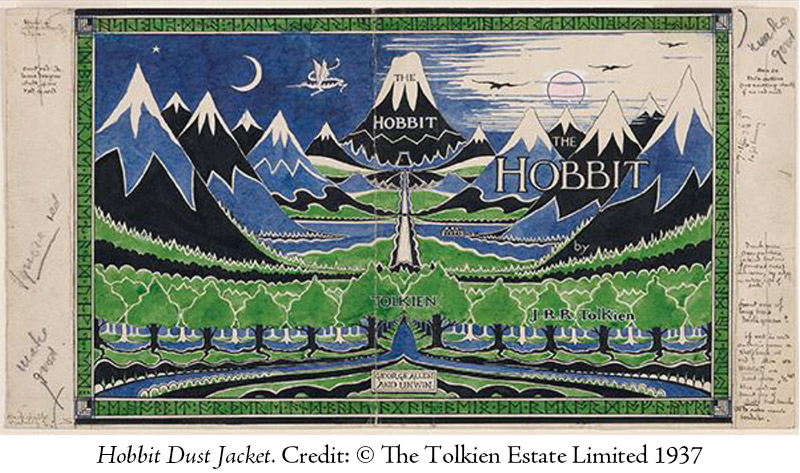 That map was created by Tolkien’s son, Christopher, with the help of artist Pauline Baynes. It was, incidentally, through her association with Tolkien that Baynes came to the attention of C.S. Lewis, leading to her best-known work, the illustrations for Lewis’s Chronicles of Narnia series. An unassuming pencil-drawn map, however, holds the attention longer than anything else. Patched together by tape, having a central section pasted over with a square of a highly-detailed segment that Tolkien clearly wanted to do over, browned with age and burned in one spot by a bit of ember dropped from Tolkien’s ever-present pipe, this treasure of a map is The Lord of the Rings in visual form. It is the very map that preceded the books—Tolkien used it throughout as his master blueprint for locations, distances, topography, and directions, and it is one reason why, when reading The Lord of the Rings, one can feel the very earth under one’s feet. Like his writings, this map continues to reward no matter how closely one considers it. The tight turns in rivers and creeks, the mountain ranges, the footpaths and roads that make visceral sense in the detailed topography—all labeled with Tolkien’s precise, tiny printing—look like nothing so much as a map of a real place. It is the kind of map that one could only draw if one had spent hours lovingly perusing maps of actual places that one knows. After Oxford, my next stop was to a friend on his farm in Herefordshire. We and our wives wound our way into the Malvern Hills, then hiked to the top of The Beacon, their highest point, where one of a chain of watchfires was lit to spread warning of the approach of the Spanish Armada. With the first breathtaking panorama of fields and trees and hedgerows and villages and with the looming Black Mountains of Wales on the horizon, it became real to me that Tolkien wasn’t writing about an imaginary world, but about a place and a people he knew intimately. Yes, one can read that Tolkien wanted to create a mythology for England to replace one lost long ago in the mists of time and under layers of successive invasions. But as one looks out over such a landscape and instantly recognizes the Shire and the danger in which it ever is, such an idea is no longer abstract. When entering the Bodleian exhibition, one sees shelves of Tolkien’s books, translated into dozens of languages, showing the deep resonance these works have had with readers around the globe in the eighty years since the first hobbit appeared on a printed page. Their archetypal universality is attested to by the chord they strike in the human heart wherever and whenever they are read. And yet, like most great stories, they are, at root and behind veils of myth and metaphor, about particular people on a certain patch of soil they call home, both of which are worth defending against those who wish them harm.